Late Friday afternoon, Standard & Poor’s (S&P) announced it was downgrading the credit rating of U.S. Treasury securities from AAA to AA+ and retained its negative outlook. Although S&P previously announced it was considering a downgrade, the announcement was a bombshell dropped at the end of a tumultuous week of economic and political news. After weeks of political posturing and rancorous debate, Congress passed the Budget Control Act of 2011, increasing the debt ceiling. President Obama signed the legislation on August 2, thereby avoiding a potential default by the U.S. government. After the debt deal was done, Moody’s and Fitch Ratings announced they would retain their AAA rating of U.S. Treasuries but continue to monitor U.S. fiscal health. The Dow Jones Industrial Average ended a 9-day losing streak with a blistering 334 point decline; wiping out all of the gains for 2011. S&P capped the week by announcing their downgrade. Since Friday afternoon, politicians, economists, and pundits have been discussing the impact of the downgrade. There has also been a lot of pointing fingers of who is to blame for tarnishing the image of the U.S. It has also left a lot of people wondering about the real implications of a downgrade in the credit rating of the U.S. Government. Here are a couple of things I think you can expect from the downgrade. There is a bruising to the American pride and psyche. Nothing has changed since Friday, but most Americans want to believe we are the best of the best. The downgrade is likely to increase the uncertainty and pessimism of the American consumer. Interest rates won’t change immediately. Interest rates are effectively determined by the free markets, not by S&P. A credit ratings agency simply tries to assess the risk of a particular security, but it’s up to the market to decide the interest rate. Don’t expect interest rates to change in the near future, but there could be some upward pressure on rates if investors become more leery about the fiscal stability of the U.S. government. The stock markets aren’t going to crash. As anticipated, the markets were battered yesterday and lost about 5% of their value, but it’s not a direct correlation to the S&P ratings change. Remember the Dow took a 334 point hit last week before S&P made its announcement. Furthermore, the 10-year Treasury yield fell from Friday’s rate of 3.558%. This means investors bought more Treasuries; the very securities that are supposedly more risky. The selloff is more attributable to the poor outlook of the global economy and European sovereign debt worries. Investors are seeking stability, so they’re buying up Treasuries and gold. There is one potential redeeming element which may come from the downgrade, but it’s far from certain. This might serve as a wake-up call for our political leaders to get serious about the fiscal future of our country. As I wrote last week, the debt deal was long on promises and short on spending cuts. In my opinion, a 0.6% cut in spending for 2012 is a pittance in light of overall spending. The rating downgrade could prompt our leaders to get serious about tackling the debt and deficit. No longer is it just extreme fiscal conservatives who think it unrealistic for the U.S. government to overspend by $1 trillion each year without consequence. 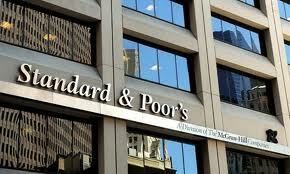 Standard & Poor’s is a significant player in the global economy. You may question the timing and motivation of their downgrade, but it should serve as a clarion call of the long-term risks and ramifications of our debt and deficit spending. I can only hope our politicians are listening and have the courage to do something about it.